Plant cell structure is not included in all health science subjects (e.g. all courses in anatomy & physiology) but is is an important part of general biology. Basic cell biology is included in UK A-Level Biology and equivalent courses. It is also useful general knowledge for anyone working in life sciences. This page helps with the task: With the help of a diagram describe the structure of a plant cell. Note: The diagram above is a general plant cell - so not a particular part of any specific plant. The labels in pink are links to pages of further information about the part of the plant cell indicated. The structures are not necessarily drawn to scale but in enough detail to aid recognition and to help students re-draw this diagram by hand to include in study notes or homework. The structure of plant cells has similarities and differences compared with the structure of animal cells. 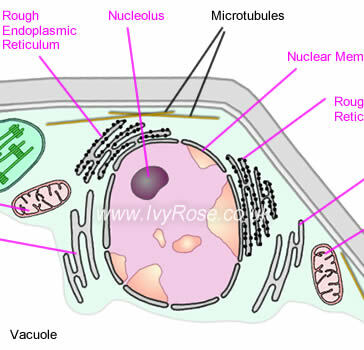 The following table lists the parts of plant cells shown in the diagram above with brief notes about each of the structures types of organelles in plant cells. Plant cells have cell walls - as compared with animal cells which do not have cell walls, and prokaryotic cells (bacteria) which do have cell walls but they are of a different construction than those of plant cells. The main functions of plant cell walls are mechanical. Plant cell walls form part of a transport system called the apoplast system via which water and some solutes can pass through plant tissue via apoplastic pathways (along / through cell walls) and symplastic pathways (i.e. through the cytoplasm of a series of adjacent cells). The most important chemical composition of a plant cell wall is cellulose. Long cellulose molecules grouped into bundles called microfibrils are twisted into rope-like macrofibrils. Sometimes there is also another layer component of cell wall e.g. lignin - which gives strength, e.g. strengthens wood (xylem cells) in trees. suberin - which helps prevent water from penetrating, e.g. suberin in mangroves minimize salt intake from their habitat. As a differentially-permeable surface, the plasma membrane controls movement of solutes in and out of the cell. The plasma membrane is flexible enough to move closer to or away from the cell wall - according to changes in the water content of the cytoplasm within the cell. Plasmodesmata are tiny strands of cytoplasm that pass through pores in plant cell walls, forming "connections" or "pathways" between adjacent cells. Specifically, plasmodesmata form the symplast pathway for the movement of water and solutes through plant structures (see diagram, above-left). These cell-cell connections are especially important for the survival of plant cells during conditions of drought. The cytoplasm is the part of a plant cell that includes all the contents of the cell within the cell membrane but outside of the nucleus of the cell. It therefore includes the cytosol (i.e. 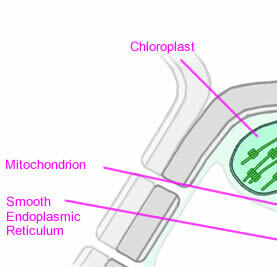 the semi-fluid part of a cell's cytoplasm - as shown shaded pale green in the diagram above) as well as the plant cell organelles incl. mitochondria, chloroplasts, etc.. Also located within the cytoplasm is the cytoskeleton, which is a network of fibres whose function is to provide mechanical support to the cell, including helping to maintain the cell's shape. In short. cytoplasm consists mainly of water and contains enzymes, salts, organelles, and various organic molecules. It has a clear appearance (i.e. in colour) and a gel-like texture. The cytoplasm helps to move materials around the cell and also dissolves cellular waste. A cell's vacuole can occupy a large proportion of the total volume of the cell - e.g. 90% of the volume of some mature plant cells. 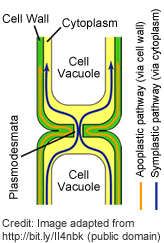 Each vacuole is enclosed by a vacuolar membrane called the tonoplast. Cell sap, which is a solution of salts, sugars and organic acids. Enzymes needed for recycling components of cells, e.g. chloroplasts. Anthocyanins are sometimes present in cell vacuoles. These are chemical pigments responsible for some of the (non-green) colours of glowers, e.g. reds, blues, purples. Helps maintain turgor pressure pressure (turgidity) inside the cell. This pressure pushes the plasma membrane against the cell wall. Plants need turgidity to maintain rigidity. The nucleus is the "control center" of a eukaryotic cell (i.e. plant cells and animal cells - but not bacterial cells, which do not have a membrane-bound cell nucleus). The cell nucleus controls the activity of the cell by regulating protein synthesis within the cell. Each cell nucleus is surrounded (one could equally say "enclosed") by a nuclear membrane that is also known as the "nuclear envelope". The contents of the nucleus - so, inside the nuclear membrane - includes DNA (genetic material) in the form of genes and a nucleolus. The nuclear membrane is also known as the nuclear envelope and encloses the contents of the nucleus of the cell - separating the contents of the nucleus from the rest of the cell. Nuclear pores in the nuclear membrane enable various substances, such as nutrients and waste products, to pass into and out of the nucleus. Rough endoplasmic reticulum is the site of protein synthesis (which takes place within the ribosomes attached to the surface of the RER) as well as storage of proteins and preparation for secretion of those proteins. Smooth endoplasmic reticulum is the site of lipid synthesis and secretion within cells. the singular form is "mitochondria"
Mitochondria are structures found in both plant and animal cells. They are bounded by double membranes, the inner of which is folded inwards, forming projections (called cristae), hence the representation of mitochondria in diagrams e.g. as above. Their function of mitochondria is energy production. Mitochondria contain enzyme systems needed to synthesize adenosine triphosphate (ATP) by oxidative phosphorylation. The quantity of mitochondria within cells varies with the type of cell. In the case of plant cells, mitochondria may be particularly abundant in sieve tube cells (also called sieve tube members), root epidermal cells and dividing meristematic cells. Chloroplasts are the sites of photosynthesis within plant cells. Chloroplasts are very important parts of plant cells. Some cells include up to 50 chloroplasts. The number of chloroplasts per cell varies according to the type of cell and its function. They are plentiful in leaf cells that receive sunlight - as opposed to root cells that do not receive light. Chloroplasts are a type of plastid. 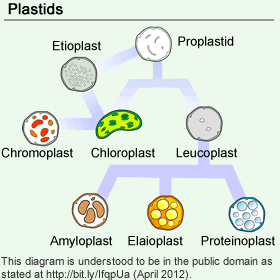 There are also other types of plastids (not all of which are present in all plant cells but all of which are derived from proplastids). See the diagram of plastids on the right. The Golgi apparatus of a cell is sometimes called the "post office" of the cell or is more generally described as a "packaging organelle" because it plays a role in transporting proteins. It's structure and appearance takes the form of a stack of tiny pancake-like shapes, each of which is enclosed by a single membrane and contains fluid and biochemicals such as proteins, sugars and enzymes. Modifies some newly-synthesized biomolecules before storing them in granules, sometimes called vesicles - ready for transport later. Forms lysosomes - which are tiny sacs filled with enzymes that enable the cell to utilize its nutrients, so are sometimes described as "cell digestion machines". Lysosomes also destroy the cell after it has died. Transports the proteins produced in the ER: After a protein has been synthesized in the ER, a transition vesicle (or "sac") is formed then floats through the cytoplasm to the Golgi apparatus, into which it is absorbed. After processing the molecules inside the sac, a secretory vesicle is formed and released into the cytoplasm, moves to the cell membrane, then releases the molecules from the cell. play a role in cytoplasmic streaming (i.e. moving the fluid cytoplasm within the cell) e.g. to/from chloroplasts. Microtubules are hollow rope-like structures composed of the protein tubulin. They can be as long* as 25μm (25 micrometres = 25 x 10-6 m) and have a diameter of approx 25 nm (25 nanometres = 25 x 10-9 m). See scientific numbers for more about these units. * some sources state up to several mm (millimetres) long. Ribosomes take part in the synthesis of some proteins by catalyzing the formation of those proteins from individual amino acids (using messenger RNA as a template). Examples of proteins catalyzed by ribosomes include glycoproteins, lysosome proteins, membrane proteins and some organelle proteins. In general, ribosomes can be either "free" (in the cytoplasm of the cell, but not within the nucleus or membrane-bound organelles) or "membrane-bound", which in the cases of plant and animal cells means attached to the rough endoplasmic reticulum (RER) - hence the black dots shown in the diagram above, distinguishing the RER from the smooth endoplasmic reticulum (SER). An individual ribosome could be "membrane-bound" while it is making one protein, then "free" while making a different protein. Some diagrams of plant cells include "free" ribosomes while others only show ribosomes attached to endoplasmic reticulum, forming RER. The information on this page is intended for approx. UK A-Level Biology (as studied by some 16-18 yr olds) and international equivalents. Students of more or less advanced courses may be expected to describe these parts of plant cells differently - e.g. in more or less detail. The numbers above-left are just for ease of reference to this table. They do not indicate numbers of chloroplasts, ribosomes, etc..